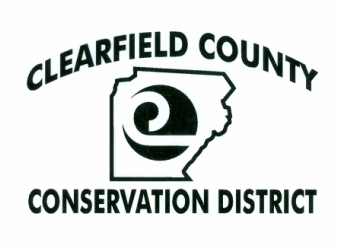 Welcome to the home of the Clearfield County Conservation District! The Clearfield County Conservation District's mission is to aid landowners, farmers, and companies to develop plans to reduce the impact on the environment. Our objective is implementation through education to protect our natural resources today and tomorrow. The District offers a variety of services and resources. These are available to farmers as well as homeowners, educators and companies that are looking for information about how to conserve our natural resources and protect the environment. ​Our District Meetings will now be held at 9AM on the second Thursday of the month at our District Office.